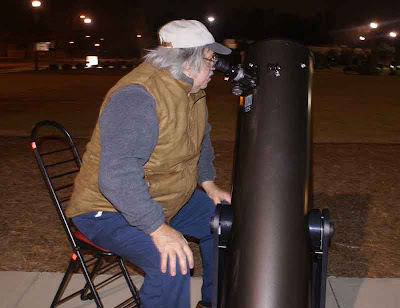 Each month I will describe sights of interest in the night skies of South Carolina. These sights will be broken down into three sections; what you can see with the naked eye, with binoculars, and with a small telescope. The best time to view the night sky is at and around the times when the Moon is not visible, what is known as a New Moon; which will occur this month on November 6th. For November, your best viewing nights will be from November 1st through November 11th. 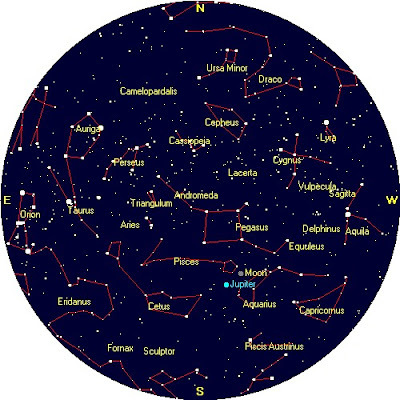 The Star chart below is set for Florence, SC on November 15th at 9 pm. 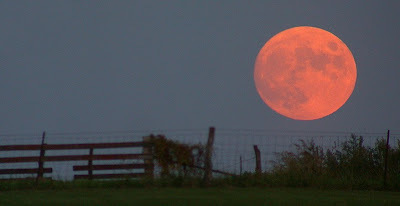 November is a little late for a Harvest Moon, however I was amazed to have three people come up to me over the last month to ask what is a Harvest Moon. Therefore, I would like to take the time to also give the answer to my readers. The short and simple answer is that a Harvest Moon is the full Moon closest to the Autumnal Equinox; therefore occurring near the time that farmers harvest their fields. The rising full moon just after sunset would then allow them to extend the time of their harvesting by using the light of the full Moon. However, there is a longer answer to this question. What few people know is that one to two days after the full Moon, the farmers can still use the Moon to extend their harvesting. This situation only occurs in the autumn, thereby extending the concept of a Harvest Moon. The reason is as follows. The Sun and all the planets are located on about the same plane. This is the reason that you always find the planets by looking in the region of the path of the Sun. 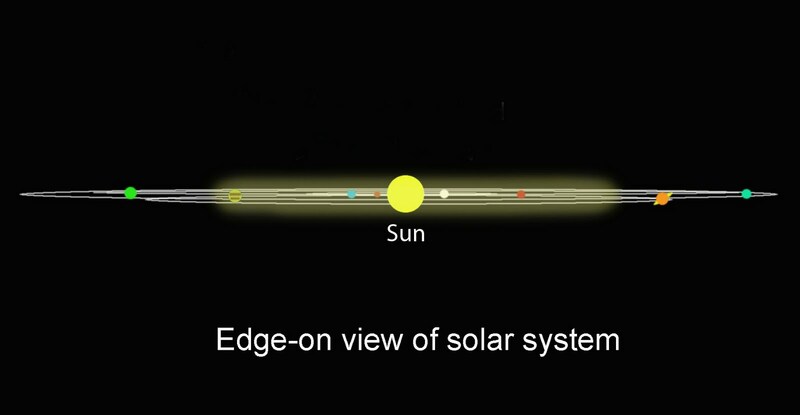 However, the plane of our Moon’s orbit is tilted versus the plane of the solar system. You know this to be true, because if the Moon’s orbit was on the same plane as the solar system, then each month we would have one solar eclipse, and one lunar eclipse. 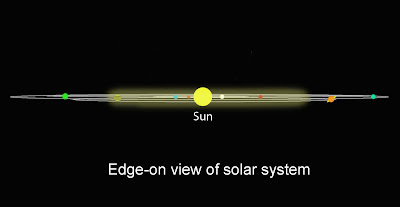 Instead, each month the Moon passes below or above the Sun, and on chance occasions, it eclipses the Sun. Now remember our Earth is tipped 23 ½ degrees, and as we circle the Sun, this effect our Earth/Sun perspective; know as the change of seasons. Now, back to the Harvest Moon: Combining the above parameters, at any given month of the year, the angle of our Moon’s orbit versus the visible horizon will vary. This change results in an interesting effect on Moon rises. 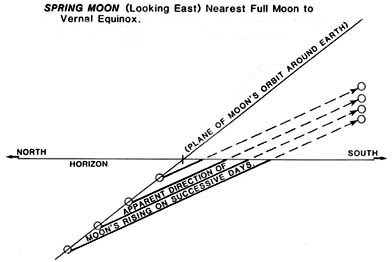 The full Moon in spring near the Vernal Equinox follows a path that results in a large angle of the Moon’s orbit to the horizon, see below. Direct your attention to the lower left side of the image, and note how far below the horizon the Moon is located each night after the full Moon. The farther the Moon is below the horizon, the longer it will take to rise on the next night. 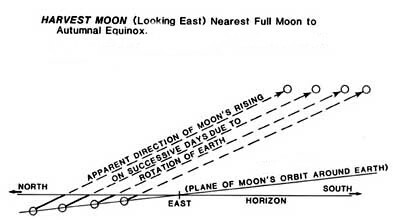 Now, the full Moon in the fall near the Autumnal Equinox follows a path that results in a small angle of the Moon’s orbit to the horizon, see below. Again direct your attention to the lower left side of the image, and note how far below the horizon the Moon is located each night after the full Moon. The Moon is relatively close to the horizon on the nights following the full Moon. Therefore, on the nights following the Harvest Moon, the Moon will rise only a short time later than the previous night. So, during Harvest, the night after the Harvest Moon, the farmer can continue harvesting in the twilight for about 20-25 minutes after Sunset, and again he will enjoy the Moonrise so he can continue his work. After the springtime full Moon, on the next night the Sun would set, and darkness would come, and it would take about 80-90 minutes after sunset until the Moon rises. This was definitely not a year for comets. Remember, on most years, there are visible comets, but usually only through good wide field telescopes. For most people, we wait for comets that are visible to the naked eye, or at least visible with simple binoculars. The only chance you will have to see a comet this year will likely be this month since Comet Hartley has just passed below the plane of the Earth’s orbit, and is now positioned to better reflect light off of its tail. Below is a telescopic view of the comet in October. There is a great possibility that you will be able to see the comet if you go well away from the lights of the Florence area. If it does not become a naked eye sight, you should be able to follow the comet throughout November using just seven power binoculars. The image below shows the approximate path of Comet Hartley from November 1st to December 1st. Note, in general, you should look to the left of the easy to locate constellation Orion. There is one downside, the comet is not visible until late at night, and even better after midnight. 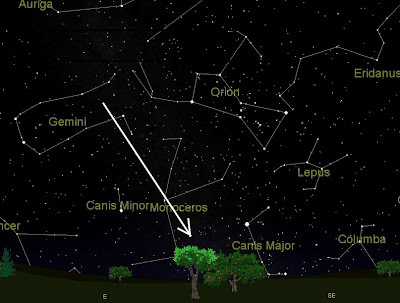 Naked Eye Sights: Jupiter will continue to be the brightest “star like object” this month. Jupiter has been moving “backwards,” to the west for some time. This is known as retrograde motion. On Nov 19th, it will “stop,” and then return to its normal easterly movement through the starry background. 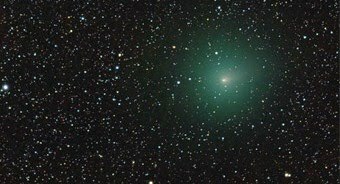 If we are lucky, Comet Hartley may be visible from a dark sky site. 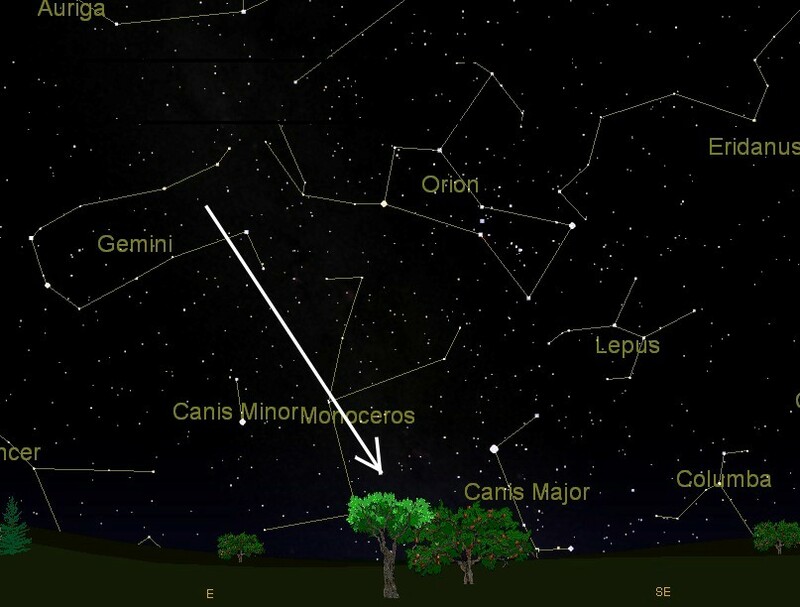 The Leonid meteor shower will peak from Nov 16th to 18th, and although it is not predicted to be a great shower this year, the presence of the nearly full Moon will greatly lessen any chance for a good meteor shower. Binocular Sights (7 to 10 power): Attempt to locate Comet Hartley. Telescope Sights (60-100mm): Jupiter remains the best target for this month high in the southern sky.